Indoor air quality (IAQ) is an important health concern because we spend substantial amounts of our daily lives indoors. Poor indoor air quality can cause a variety of symptoms ranging from allergic-type reactions to headaches, fatigue, nausea and illness. Symptoms will generally be more pronounced in susceptible individuals such as children, the elderly and those with already compromised immune systems and respiratory conditions. The LEX consulting team has the extensive experience investigating and assessing indoor air quality and mould issues and developing targeted scopes of work to address complaints. We provide investigative services to identify unknown air quality issues and provide targeted testing and assessment. LEX will provide detailed recommendations for the mitigation of identified air quality issues and directions for further testing if required. Mould spores are present in all indoor and outdoor air; however, elevated indoor spore levels can indicate possible mould growth within your workplace or home. Prolonged exposure to elevated mould spore levels can negatively impact health with symptoms ranging from allergic-type reactions to migraines and flu-like symptoms. The effects will generally be more pronounced in susceptible individuals such as children, the elderly and those with already compromised immune systems and respiratory conditions. It is important to investigate potential mould growths following water infiltration events such as toilet overflows, roof leaks, and in situations that would produce high levels of humidity and condensation. 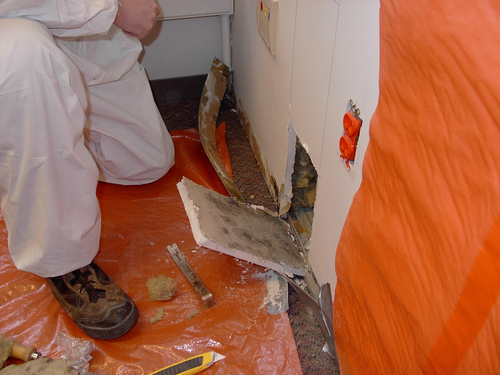 If a water damaged area is not investigated immediately, the likelihood of developing mould growths is accelerated and intrusive remedial activities may be required. LEX understands the urgency of assessing such situations and has a proven ability to deploy experienced staff on short notice for emergency investigations. Volatile Organic Compounds (VOCs) are common air pollutants found in indoor and outdoor air. Negative health effects arising from exposure to VOCs are generally dependent on the nature of the compound, the level and duration of exposure, and individual sensitivity. VOCs are present in low levels in a wide range of products and materials used in building construction and furnishings, as well as in cleaners, paints, fuel, personal care products and combustion by-products. Activities such as smoking, cooking, and burning wood indoors can also increase the level of VOCs present in indoor the air. Formaldehyde is a common VOC that is used in a variety of products and historically in Urea Formaldehyde Foam Insulation (UFFI). Exposure to high levels of formaldehyde has been linked to increased cancer rates. Use of UFFI insulation has been banned in Canada since 1980 due to the high level of formaldehyde emissions, but it may still be present in legacy buildings. Short-term exposure to high levels of some VOCs can cause headaches, nausea, breathing problems, and irritation of eyes, nose and throat. Chronic exposure to some VOCs can cause more severe health effects including cancer, liver and kidney damage, and central nervous system damage. LEX can offer other specialty services to suit project needs. Please Contact Us for more details..